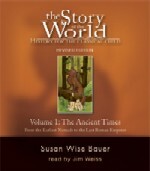 This Story of the World audiobook is a collaboration between Jim Weiss, whose voice is “liquid gold” (CNN TV), and Susan Wise Bauer, whose writing has been described as “timeless and intelligent” (Publishers Weekly). It may be used along with the print book, as a supplement to a traditional history curriculum, or independently. Susan Wise Bauer is a novelist and educator. With her mother, Jessie Wise, she co-authored The Well-Trained Mind: A Guide to Classical Education at Home (revised edition, Norton, 2004), a book that has rapidly become an educational standard. Susan teaches at The College of William and Mary in Virginia. She was home-educated herself; she and her husband Peter teach their four children at home as well. Jim Weiss has been a storyteller for over 25 years. Winner of over 75 major national awards, he brings to life histories and pieces of classic literature ranging from the story of Galileo’s life to the history of America in the time of Lincoln, from Arthurian legends to Greek myths, from Aesop to Shakespeare. Ancient Times (5000 BC to 400 AD) - History is a story; Isn’t it time you read it that way? This engaging guide presents world history in a narrative format. What terrible secret was buried in Shi Huangdi’s tomb? Did nomads like lizard stew? What happened to Anansi the Spider in the Village of the Plantains? And how did a six-year old become the last emperor of Rome? Don’t just read about history — experience it! Build a model of the Crystal Palace, make Ned Kelly’s armor, and color and construct a timeline of the Modern Age. This comprehensive activity book and curriculum guide contains all you need to make history come alive for your child. Along with the accompanying book The Story of the World, Volume 4: The Modern Age, this Activity Book provides a complete history program. If you purchase this Activity Book, you have permission to copy the maps and coloring pages for use within your own family. 42 tests: one for each chapter of The Story of the World. Perfect for evaluating comprehension and retention. The narrative format of The Story of the World helps children remember the famous people, places, and events in history. These tests offer you an easy way to make sure that your child is absorbing the important events from world history. A combination of multiple choice, matching, fill-in-the-blank, and short writing samples allow you to evaluate your child’s retention and comprehension of key events in The Story of the World.